In his end of year news conference, President Vladimir Putin made claims about Ukraine, Crimea, the Russian state media as well as series of domestic issues – many of which Polygraph.info, Factograph.info and other news media have fact checked and, in some instances, debunked. President Putin’s assertion the Russian Army is not involved echoes years of Kremlin’s denials of Russian involvement in the Donbas – despite evidence that “…is overwhelming and has been confirmed by numerous open-source investigations…” As the Polygraph.info fact check states: Key Ukraine separatists military and political leaders were Russian citizens. Foreign and domestic media documented the presence of Russian “volunteers” fighting for the self-proclaimed republics. International intelligence organizations like Bellingcat published evidence of Russian military presence, including social media posts of Russian soldiers themselves. In addition, the presence of Russian tanks in the area has been documented and claims that the weapons were captured from Ukrainian army supply depots have been debunked. On the question of whether Russia annexed Crimea legally, Putin cites the 1954 handover of the Crimea to Ukraine, which he said was illegal. “I won’t say anything beyond this point. 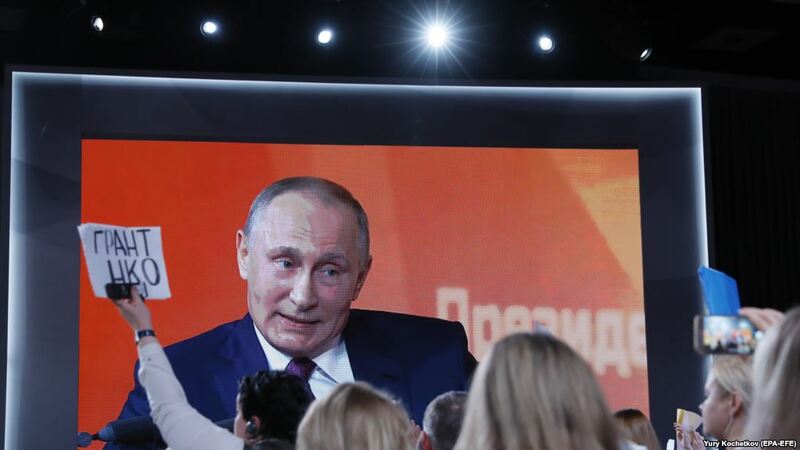 The people of Crimea determined their fate the way they did,” said Putin, apparently referring to the March 2014 referendum that showed 97 percent of Crimeans voted for independence from the rest of Ukraine and to become a part of Russia. Taking questions on U.S. politics at his marathon news conference, President Putin rejected allegations of Russian interference in the U.S. 2016 presidential election. “You know this is all fabricated by the people who are in opposition to Trump to make his work illegitimate,” said Putin. He went on to compare the political turmoil to the bilateral dispute over Russia’s state-funded news services – RT and Sputnik. Putin characterized the Russian involvement in the U.S. media marketplace as “minimal compared to what American global media is doing around the world and here in Russia. And that seems to be a threat,” he said. In Russia, VOA and RFE/RL, U.S. government broadcasters, are banned from television and radio while RT is carried on many U.S. commercial cable TV systems and Sputnik operates openly — including on a radio station in Washington, DC. In November, RT and Sputnik registered as foreign agents, under U.S. government pressure to do so. The Executive Committee of Correspondents at the U.S. Capitol quickly revoked the credentials of the two broadcasters to cover Congress. In a series of exhaustive fact checks of RT’s foreign agent filing, Polygraph.info established the official direction to the broadcaster from Putin included “propagating and promoting the formulation of Russia’s positive image globally” and that the two broadcasters are part of a government-owned “pyramid” of entities. On Thursday, Putin said the U.S. and Russian governments should quit quarreling. “We need to learn from it and move on and not attack each other like wild animals. We need to think about it and learn our lessons,” he told reporters in Moscow.